This entry was posted in Orchard and tagged almonds, apples, chestnuts, medlar, mulberry, orchard, pears, plums, quince, walnuts on April 23, 2014 by JV. Whilst inspecting the bee hives today, we noticed that one of the nut trees planted recently had been savaged, with all of the young growth eaten. Given the height and nature of the damage, it seems almost certain that deer are the culprits. Something will need to be done to try to exclude them from this future orchard site. There is certainly no point in planting further trees until the deer can be effectively excluded. It is not obvious where they are gaining entry, as we have a particularly large and thick privet hedge running along the open side, yet we have in the past seen deer force their way through the hedge. The chestnut may regrow reasonable shoots, in which case we will keep it, otherwise it will be replaced. Some chicken wire was placed temporarily around the tree to deter further damage. Interestingly, the walnut, planted at the same time, was not touched. 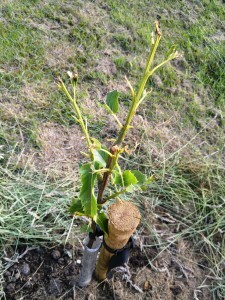 It is always so disappointing when plants are lost to pests, especially permanent planting such as fruit and nut trees. This entry was posted in Orchard and tagged chestnuts, orchard on July 5, 2013 by JV. This entry was posted in Orchard and tagged chestnuts, orchard, walnuts on June 22, 2013 by JV.